Who doesn’t like to take a nice cool dip in the heat of the summer in their own private pools? The heat of the sun and coolness of the pools perfectly balance out each other. But does that mean that the pools in our backyard are only restricted to the summer season? Why can’t we enjoy a nice warm dip on the relatively cold or breezy days? High end swimming pools often have a heater to help with this. The types of heaters generally vary. Some have to be fueled by coal or wood. Others can be powered by a lot of electricity. But, with the current state of the environment, we need to try and reduce our carbon footprint as much as possible. Both these alternatives, especially the former one, leave a significant amount of direct and indirect carbon footprint. This is where the solar powered pool heaters come in. These heaters harness the energy of the sun to generate heat. Not only do they have a low carbon footprint, but there are almost no operational costs. Here is a list of some of the best solar powered heaters that money can buy. The SunQuest takes the lead in this list with a 5-star rating. At a whopping price of $645, this solar heater comes packed with all the things necessary to get started. Unlike other solar heaters, you do not need to buy separate kits to finish installation. You will however need to purchase separate piping to help. 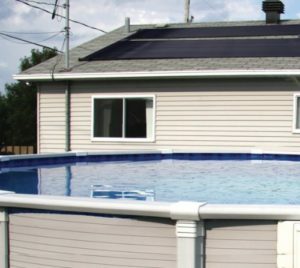 This heater passes the pool water through the solar panels and uses the heat absorbed from the sun to heat the pool water. It is perfect for both above ground and in-ground swimming pools. Using this technology, the SunQuest Solar Swimming Pool Heater can raise the temperature of the water by about 10 degrees. Next on our list the Smartpool WWS801P pool heater. It measures 80 square foot and can be mounted on any roof. 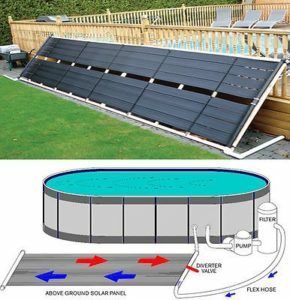 Unlike our previous entry, this solar heater works only for in-ground swimming pools. However, it does work in a similar way by passing the water through the panels that absorb the heat of the sun. The panels are sold for $232. But, you do need few other things that are important to use this. These include a Sunheater systems kit ($54) and a pool heating control system ($275). The total comes somewhere around $561. This Solar heater from Globe Warehouse contains of 2 easily roll able solar panels each having an area of 40 sq. ft. It can be installed by anyone using the instruction manual. It also comes with “O” rings, end caps and hose adapters. 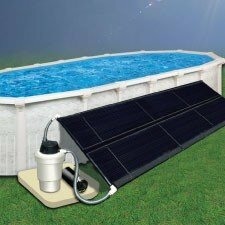 This solar heater is capable of raising the temperature of the water by 11-15 degrees F. It works in line with most pool pumps and can be purchased for $228. Fafco’s solar water heaters are one of the most popular ones online. They apply the same principle of passing pool water through the solar panels to heat them. These panels can be mounted on the ground or on the roof. They operate at optimum conditions from 10 am to 4 pm when placed at an inclination of 30 degrees facing the south. The UV protective layer keeps the panel safe even after years of exposure to direct sunlight. The price is a bit on the higher side. However, there is no additional equipment that you need to buy. If you choose, you can buy the repair kit worth $38. The SolarPRO Contour pool heater from Game can heat a pool of up to 1000 gallons. It’s been cleverly molded using the principle of a greenhouse that will help to keep all the heat trapped in as the water circulates around the tubes. The water flows at a rate of about 19 gallons per minute and has a capacity of 1.5 gallons. The legs of this device are foldable thus making it quite compact and fit for any shed. 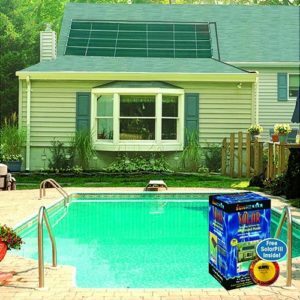 The SolarPRO is mainly used for above ground pool heaters. It also comes with adapters for Intex and Bestway pools. However, it can heat the pool by only 7 degrees Fahrenheit. With an attractive price of $115, this is one of the best buys available in the list. The SolarPRO Curve is the counter-part to the Contour version. With its curved surface, it can maximize the heat that is being transferred to the water. This shape also helps it absorb more sunlight during any point of the day. It keeps the heat locked in while the unique design helps it deflect any cool winds to prevent heat loss. The structure is made from commercial grade materials to ensure that it can withstand any mishaps that might befall it. The threaded ports allow a variety of plumbing options. This helps it increase the temperature of the pool by 5 degrees in just 5 days. 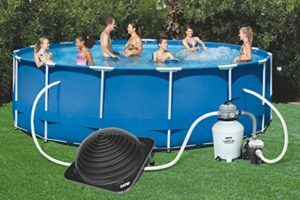 You can easily connect this to the in-ground or your above ground pool to increase the temperature at your convenience. If you feel the need, you can also connect multiple pool heaters in series to increase the temperature or reduce the duration of heating. 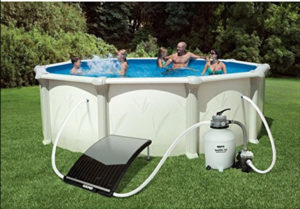 This Pool heater by Yescom will keep your pool at a warm and comfortable temperature. It works much better than conventional solar pool heaters in the market. This one works faster and is much more efficient in raising the pool temperature. It can raise the temperature of the pool by about 20 – 30 degrees Celsius which is more than most of the solar pool heaters in the market. It can withstand any type of weather due to its strong construction. Thus, you don’t need to worry about leaving it outside all the time. It is also resistant to any chemicals that you may find in pool water. It won’t get scratched easily and ozone can’t affect it either. It is also resistant to UV radiation. This pool heater can easily be installed by anyone. It can be either hung on the roof or mounted beside the pool at an angle. This Product from Blue Wave is a collaboration with GAME. Game manufacture this Solar Pool heater for Blue Wave according to the specifications provided by them. This is capable of heating a pool that is about 30 feet round or has a capacity of 12,000 gallons. The curved shape helps it trap in heat from all directions and thus use it heat the pool water. The tubes inside this heater measure a total length of 51 feet and have a thickness of 1.2 inch. It claims to increase the heating capacity by 40% every cycle, thus lowering the time that is needed to heat the pool water. The installation can be performed by anyone, as it a simple one. All the parts that are required to install the heater come with the package itself. If you want, you can combine more than one heater to increase the heating capacity of the whole system. Doheny’s pool heater will help you have one of the most comfortable pool experiences ever. All you need to do is install this into your existing pool system and the water will be heated without using electricity or gas. It works the best when installed near a location which receives ample sunlight. The water runs through it and gets heated up easily and then flows back into the pool. Using this technique, the temperature of the water can be raised by around 10 to 15 degrees. You can install this on the roof or on the board near your pool, it will work well either way. 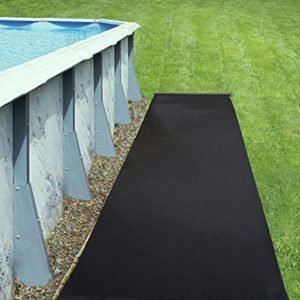 It can be used for both in-ground and above-ground swimming pools. 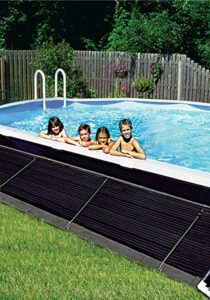 This new solar power heater from SunHeater can help you enjoy a relaxing dip in the pool no matter which season it is. It can raise the temperature of your pool water by 10 degrees Fahrenheit or more if possible. The package comes with 2 feet by 10 feet panel through which the water will flow and eventually get heated up due to the heat of the sun. This system can also be used for soft-side pools since it comes with the suitable adapters for it. It can be installed by just about anyone. All one needs to is connect it with the existing pool pump system and then enjoy the warm, soothing pool water. The tube designed like a web helps absorb most of the sun’s heat energy to provide you with fast and effective heating. The package also comes with everything that one needs to set up this system. With advancements in technology and the evolution of people, the standard of living of everyone increases. However, this standard of living was only possible due to the use of certain resources that have started to get depleted now. But, thanks to the same advancement in technology, we need not compromise on comfort and still look after the environment in a sensible way. The creation of Solar Powered Pool heaters is one such example. It shows how we can enjoy the comfort of a warm pool without burning any fossil fuels. So, if you do decide to go green while still enjoying the warmth of a nice pool, go and buy one of these products suggested by us. Each of them have their own advantages and disadvantages that have been researched by us. It is up to you now to select the pool heater that best suits your needs. If you do have any suggestion of other solar pool heaters, then don’t hesitate to tell us. Enjoy your dip in your warm pool!